seeking to diversify weapons systems, officials said on Wednesday. Manila received about 5,000 Kalashnikov rifles, 5,000 steel helmets, about a million rounds of ammunition for the rifles and 20 army trucks in a ceremony attended by President Rodrigo Duterte, who also toured one of five visiting Russian warships. The gift came a day after Russia and the Philippines signed two military pacts, including a sales contract with Rosoboronexport, a state-owned vendor of Russian defence equipment. Lorenzana said the Rosoboronexport contract was not a sales deal but signalled the Philippines’ intention to acquire small arms, vehicles and special equipment for disaster operations. But the Philippines’ biggest source of arms, the United States, was not worried at the prospect of equipment donated by its rivals China and Russia. “I don’t attach very much significance to it, some trucks or guns being dropped off to a country that’s fighting terrorists right now,” U.S. Defense Secretary Jim Mattis told reporters on the plane to Bangkok. The United States and China dominate regional arms trade. Since 2000, the United States has donated close to $1 billion (754.46 million pounds) worth of military equipment to the Philippines, ranging from surveillance planes, drones and boats to small arms. China, which promised to donate a third shipment of small arms after a meeting on Wednesday between Lorenzana and his Chinese counterpart, General Chang Wanquan, has already given the Philippines about $7 million in small arms. 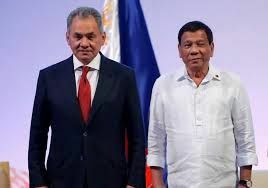 The deals with the Philippines will allow Russia to expand its arms market in the region, said another senior Philippine official, who declined to be named because he was not authorised to speak to media. The Philippines is now open to buying Russian arms as Manila cultivates closer ties with Moscow, he added, particularly as the military looks to diversify its equipment, reining in costs while maintaining quality. “Moscow has been offering to sell arms to us since the mid-1990s and they are willing to barter guns for bananas,” he said, adding that Russia was selling fighters, helicopters and submarines to the Philippines.